Handelsblatt was established in 1946. Since 2016, its editor-in-chief is Sven Afhüppe. Its publisher, Verlagsgruppe Handelsblatt, also publishes the weekly business magazine Wirtschaftswoche of which the editor-in-chief is Miriam Meckel since 2014. Handelsblatt's headquarters are in Düsseldorf. Since September 2005 Handelsblatt has been offering an online lexicon called WirtschaftsWiki which features definitions of terms used in economics and politics. The database can be modified by any registered user. In September 2006 Handelsblatt ranked all economists working in Germany, Austria and the German-speaking part of Switzerland. The paper is published in compact format. In 2009, Dieter von Holtzbrinck bought Der Tagesspiegel, Handelsblatt and "WirtschaftsWoche" from the Georg von Holtzbrinck Publishing Group. In 2014, Handelsblatt launched a digital, English-language edition, called Handelsblatt Global Edition, which aims to reach an international audience interested in German business and finance news. The editor-in-chief is Andreas Kluth. The Global Edition is published five days a week from its editorial office in Berlin. 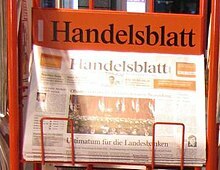 Handelsblatt had a circulation of 127,546 daily copies in 2018. ^ Carsten Croonenbroeck; Roman Matkovskyy (July 2013). "Is the Market Held by Institutional Investors? The Disposition Effect Revisited" (Discussion paper. No: 338). European University Viadrina Frankfurt. Retrieved 3 February 2015. ^ Gabor Steingart new CEO of Verlagsgruppe Handelsblatt. Horizont.net, 4 November 2012. ^ "Handelsblatt and WiWo continue to lead the German market". Advance Media. Archived from the original on 3 February 2015. Retrieved 3 February 2015. 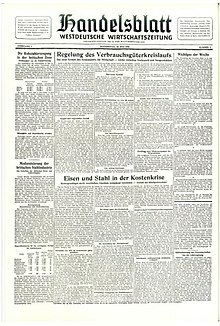 ^ "German Online Newspapers and Magazines". Almania Information Center. Archived from the original on 2 January 2015. Retrieved 28 March 2015. ^ "Wirtschaftslexikon". Handelsblatt. Retrieved 3 February 2015. ^ "References". Tolerans. Retrieved 5 February 2015. ^ ""Handelsblatt" bringt englischsprachige Ausgabe an den Start". Focus Online. Hubert Burda Media. Retrieved 7 July 2015.